Washington D.C., August 20, 2008 - On the tenth anniversary of U.S. cruise missile strikes against al-Qaeda in response to deadly terrorist attacks on U.S. embassies in Kenya and Tanzania, newly-declassified government documents posted today by the National Security Archive (www.nsarchive.org) suggest the strikes not only failed to hurt Osama bin Laden but ultimately may have brought al-Qaeda and the Taliban closer politically and ideologically. A 400-page Sandia National Laboratories report on bin Laden, compiled in 1999, includes a warning about political damage for the U.S. from bombing two impoverished states without regard for international agreement, since such action "mirror imag[ed] aspects of al-Qaeda's own attacks" [see pp. 18-22]. A State Department cable argues that although the August missile strikes were designed to provide the Taliban with overwhelming reason to surrender bin Laden, the military action may have sharpened Afghan animosity towards Washington and even strengthened the Taliban-al-Qaeda alliance. Following the August 20 U.S. air attacks, Taliban spokesman Wakil Ahmed told U.S. Department of State officials "If Kandahar could have retaliated with similar strikes against Washington, it would have." Such an attack, although unfeasible at the time, was at least in part actualized by al-Qaeda on 9/11. Following the 1998 embassy bombings, the U.S. sought to extradite bin Laden to Saudi Arabia or possibly Egypt, but failed to get bin Laden out of Afghanistan because, at least according to the U.S. Department of State, Saudi Arabia and Pakistan were unable or unwilling to apply enough pressure to coerce Taliban Supreme Leader Mullah Omar to surrender bin Laden. 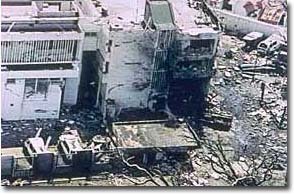 The lengthy Sandia report, compiled by Dr. Gary W. Richter and obtained by National Security Archive Middle East Analyst Joyce Battle, synthesizes an impressive volume of public-source information available on bin Laden into a coherent summary of the al-Qaeda terrorist threat following the August embassy bombings. The report concludes that the bombings did not take U.S. intelligence and diplomatic services by surprise, as the U.S. in 1998 had capable counterterrorism intelligence gathering and interdiction capabilities. However, according to the report, in retrospect, the August 20 retaliatory cruise missile strikes may have caused long-term political harm to U.S. national security and counterterrorism interests [see pp. 18-22]. The report contains extensive timelines, biographies and issue summaries and is useful for researchers interesting in the evolution of al-Qaeda and the American response. Document 1: Sandia National Laboratories, U.S. Department of Energy, Dr. Gary W. Richter, Osama bin Laden: A Case Study, December 6, 1999. The "war" against terrorism will never be "won," as terrorism will always be a global problem. The August 7, 1998, embassy bombings should not be taken as an indication that U.S. counterterrorism efforts are entirely ineffective. The August 20, 1998, retaliatory cruise missile strikes did little to help solve the problem posed by bin Laden and may ultimately prove to have done more harm than good. The risk of future attacks by Osama bin Laden or his associates using weapons of mass destruction (WMDs) is not insignificant. The root cause of the militant threat is the widespread and deep-seated discontent among a large segment of the Islamic world, as opposed to the actions or agitation of any one individual or group of individuals. As such, diplomatic options are likely to be the most effective strategies at reducing the threat. Questionable justice in that the strikes "killed only (or nearly only) individuals who were innocent of the embassy bombings"
"The attack provoked a new round of terrorist bombing plots." Bin Laden received a good deal of publicity and "appeared to many as an underdog standing firm in the face of bullying aggression." The Taliban's poor control over Afghanistan "may mean that they shouldn't bear responsibility for the acts of those on their soil." The U.S. may have given away the moral high ground by mirroring certain aspects of bin Laden's strategy with the attacks, and the U.S. bombed targets in independent third-world countries without concern for the sensitivities or sovereignty of those nations. U.S. Embassy (Islamabad), Cable, "TFXX01: Afghanistan: Reaction to U.S. Strikes Follows Predicable Lines: Taliban Angry, Their Opponents Support U.S.," August 21, 1998, Secret, 8pp. Directly following air strikes on al-Qaeda training camps in Afghanistan in retaliation for the attacks on U.S. embassies in Kenya and Tanzania, Taliban Commander Mullah Omar publicly declares the Taliban "will never hand over bin Laden to anyone and (will) protect him with our blood at all costs." The U.S. Department of State is unclear as to the current whereabouts of bin Laden, but receives information from the then-minor former Afghan politician, Hamid Karzai who tells the Department that bin Laden "is on the move" and that several Taliban officials are very unhappy with Mullah Omar "for bringing the U.S. against Afghanistan." Overall the U.S. strikes have not produced an anti-American reaction in Afghanistan, as several sources report that bin Laden's presence is seen as "more of a burden than a blessing" by many Afghans. Pakistan remains largely calm in the wake of the potentially politically inflammatory August 20 U.S. air strikes on Afghanistan and Sudan conducted in retaliation for the August 7 Embassy bombings. A Pakistani newspaper claims Mullah Omar is displeased with Osama bin Laden for threatening to retaliate for the U.S. strikes and for undermining his control of Afghanistan's international relations. U.S. Department of State Bureau of Intelligence and Research (INR) Intelligence Assessment, "Bin Ladin's Jihad: Political Context," August 28, 1998, Confidential, 2pp. Providing a brief analysis explaining the political context behind bin Laden's recent terrorist acts, this U.S. Department of State Intelligence Assessment concludes that bin Laden's extremism has found "fertile ground" in the Arab world. Recent years have brought increasing "feelings of injustice and victimization [in the Arab world] – and growing conviction among Arab elites and masses alike that US policies prop up corrupt regimes; favor Israel at Arab expense; and are designed to divide, weaken and exploit the Arab world – are rooted in negative Arab perceptions of specific US policies. Bin Ladin rides this tide of opinion. Though few Arabs endorse his terrorism, many share at least some of his political sentiments." U.S. Department of State Bureau of Intelligence and Research (INR) Intelligence Assessment, "Afghanistan: Taleban External Ambitions," August 28, 1998, Secret, 2pp. Despite the Taliban's lack of material capacity and full ideological vision to promote a large-scale agenda aiming to promote Taliban-style Islamic government across the Muslim world, there have been increasing signs, including statements by Mullah Mohammad Omar, Supreme Leader of the Taliban in response to the U.S. embassy bombings, indicating a broadening of the movement's goals and scope. The Taliban are "still country boys," however under the influence of Osama bin Laden may be expanding their sphere of influence beyond Afghanistan. The Taliban's increasing influence is already being felt in Taliban-like movements in Pakistan, and Iran continually fears Sunni cross-border subversion. Tracking the Arab and Pakistani nationals expelled from Khost, Afghanistan by U.S. air strikes, the U.S. Department of State reports Osama bin Laden has been keeping a very low profile, but is probably in Kandahar, Afghanistan, the heart of Taliban-controlled territory, while many of his followers are moving to Kabul. When in Kandahar bin Laden has been know to stay directly at Mullah Omar's residence, and is thought to have been ordered to stay close to Omar, "who can more easily keep a watch on him," in Kandahar City. The August 20 U.S. bombings reportedly killed approximately 20 Pakistani nationals and 15 Arabs who were in the camps at the time of the bombings. Relations between the Taliban and Saudi Arabia are straining under the bin Laden issue. Supreme Taliban Commander Mullah Omar reportedly has rejected the Saudi government's request that they expel bin Laden to Saudi Arabia, and furthermore criticized the government for allowing U.S. troops in the kingdom. In response to Omar's comments that the presence of U.S. troops rendered the Saudi government "illegitimate," Saudi officials are downgrading diplomatic ties, recalling its charge d'affaires in Kabul and expelling Taliban diplomats in Riyadh. The document concludes with the following thoughts from U.S. Ambassador to Pakistan William Milam, "If Pakistan - the Taliban's closest international supporter - throws in its weight behind Saudi Arabia on the bin Laden issue, the pressure on the Taliban may become unbearable. As of this time, Pakistan has not yet made its position clear." The Department of State is recommending the U.S. work closely with the Saudis and sharpen its message to Pakistan and the Taliban regarding the expulsion of Osama bin Laden from Afghanistan. Saudi Arabia remains "the cornerstone of U.S. efforts to bring bin Ladin to justice," as the U.S. feels the Taliban would consider handing over bin Laden to the Saudis, but "there appears no chance they will give him up to us." The U.S. hopes the Saudi government will have more success pressuring Pakistan and the Taliban to listen to U.S. demands. "The Saudis can also prove useful in upping the pressure on the Taliban by undertaking efforts to cut off their access to the Gulf states, most importantly with the UAE, which is the Taliban's major entrepot for trade and smuggling." Pakistan's lack of support for U.S. efforts to get bin Laden "must change." Ultimately Mullah Omar "appears to be strongly committed to bin Ladin. It is questionable whether U.S. or Saudi efforts can influence Omar's decisions. Maybe Pakistan can, but even that is not known with any certainty." Following the August 1998 Embassy bombings the U.S. Department of State questions its previous assumption that Mullah Omar, the Supreme Commander of the Taliban has only Afghan nationalist political goals. Omar's recent statements and activities indicate the leader is developing increasing sympathy for pan-Islamic movements, such as al-Qaeda. Although speculative, the Department indicates this may be the influence of Osama bin Laden on Mullah Omar. A Department source reports that bin Laden and Omar frequently eat together with their advisors and that Omar, who is "very poorly educated and unsure of foreign affairs" may be easily influenced by bin Laden's perspective. The potential ramifications for these new radical sympathies "are grim. First and foremost, it could mean that the Taliban would under no conditions expel bin Ladin because they see his cause as theirs." Three months following the U.S. retaliatory strikes on al-Qaeda training camps in Afghanistan, the Assistant Secretary outlines key points on Osama bin Laden in an effort to discuss "how we can persuade the Taliban to expel Usama bin Laden from Afghanistan to a country where he can be brought to justice or otherwise end or limit the threat he poses to U.S. interests." According to the Assistant Secretary the U.S. holds the Taliban responsible for bin Laden's activities, however efforts "to get UBL expelled have been frustrated, we believe, by his ties to Taliban leader Mullah Omar." Bin Laden is a threat to U.S. interests and people, the U.S. "can not allow this to continue." Diplomatic negotiations with the Taliban and with Pakistan regarding the extradition of Osama bin Laden have been unsuccessful and bin Laden's network continues to operate and threaten "American lives." An upcoming December meeting with Pakistani Prime Minister Nawaz Sharif may provide the Secretary with "an opportunity to get this message across at the highest level in direct terms." Months after the Embassy bombings bin Laden remains active and under Taliban protection. "Time for a diplomatic solution may be running out. Taliban brush-off of our indictment and other evidence may indicate movement from tolerance of UBL's presence to more active support." According to their senior spokesperson, the Taliban currently understand "that the U.S. in particular wanted bin Laden expelled from Afghanistan at all costs," and that "if they chose to back terrorism, they could expect to be the recipient of terrorism in response." The U.N., U.S., Saudi Arabia and Pakistan are all applying great pressure to secure the expulsion of bin Laden, but "Kandahar [Mullah Omar] was still trying to find a proper way to resolve the issue." The East Africa bombings have brought the "issue of the presence of Osama bin Laden on Afghan soil to the forefront" of U.S. security policy and discussions on human rights and narcotics should be "set aside" in order to focus all U.S.-Taliban relations on the goal of resolving the bin Laden issue. The August 20 U.S. bombings in retaliation for embassy attacks continue to be a source of distress for the Taliban. "If Kandahar could have retaliated with similar strikes against Washington, it would have. But it did not want anymore strikes against anyone." According to the Taliban, despite giving the Saudis, "an authentic proposal for resolving the bin Laden issue… that would have enabled the Taliban to expel bin Laden in a way that avoided the internal problems that the Taliban leadership feared… Saudi "pride" stood in the way." He also offers that one solution could be "for the U.S. to kill him or arrange for bin Laden to be assassinated." Although he ultimately requests that this not be done, he adds that there would be nothing the Taliban could do to prevent it. In response to Taliban intransigence on the issue of surrendering Osama bin Laden, the Saudi government is being more restrictive on Afghan travel to the holy sites and have reportedly prohibited Afghanistan's national airline, Ariana from flying between Kabul or Kandahar and Jeddah. Priding themselves on the piety of their regime, the Taliban will suffer "a great embarrassment," is their list of individuals approved "for the Haj is not accepted by the SAG [Saudi government]."